Sooo, for those of you who have followed my channel for awhile you may have noticed a few dark spots on my forehead. Let’s not get it twisted, I am blessed. I don’t have bad acne that’s uncontrollable, in fact when I go on a juicing binge (lol) my skin looks luminous! But I like cheese, and chocolate and cheese and apple blossoms and cheese too! I don’t always remember to use my Mario Badescu Drying Lotion or my Rare Earth Pore Cleansing Masque from Kiehl’s or even my PMD (Personal Microderm). So an occasional breakout leads to hyper-pigmented spots and THEN I usually forget to use my Vitamin E Oil on them to help them fade. TOO much right?!?! WELP, Antipodes Skin Care to the rescue! I love this stuff. I have now used these products for a month and am still in love. I have had two small breakouts in a month’s span, down from 4 or more. And those 4 were ugly, painful and LINGERING. These two were mostly because I didn’t wash my face the night before or had 3 candy bars during the TIMMMMMEEE (vlog reference), and exited just as quickly as they entered. 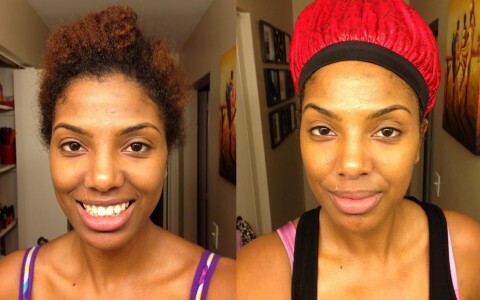 My skin was brighter, I felt like I had a glow with or without makeup. I would pass by the mirror and just have to stop for a second to make sure I wasn’t dreaming. Seriously! I was really impressed with the change in my skin. Here are a few things that I think these Antipode’s products have helped me with. 1) Consistency. Cleanser, Toner, Moisturizer, Eye Cream, BOOM! I’ve got the routine down and for me a routine is all I need to remain consistent. 2) Awareness. I understand more than ever that my face is fragile. I grew up using Dial soap and Vaseline for skin care (O_o) <gave myself the side-eye. I rubbed my eyes whenever I felt like it and never hesitated to touch my face throughout the day. I get it! When I pat the eye cream on I say to myself , “be careful girl…yes, use that ring finger”. Doing that every morning and night has given me an awareness like never before. Don’t come for my eyes….I protect them now. 3) Patience. Yes, even with the great changes I’ve seen in my skin I am still learning to be patient. I expect that for the remainder of the year (about how long I think these products will last) I will continue to see positive changes. Collagen promotion and all that. YES, I’ll take it. Check out the before and after above. Don’t I look tired in that first pic? The lighting is off so don’t pay any mind to the difference in my skin tone, but my skin’s health improvement is apparent. I also feel like my skin is just tighter….in general. Anyways if you’re interested in purchasing the products used you can find them here. Or you can click the link in the description box from the YouTube video. Hip Apotheca sent me these products and I’m so glad they did. Definitely going to purchase them in the future. Hopefully not until 2014…cuz this stuff LASTS!